The ETSU Model United Nations Club familiarizes students with the roles and involvements of the United Nations. Students are given the opportunity to participate in mock simulation conferences where they assume the role of diplomats for an assigned member state. 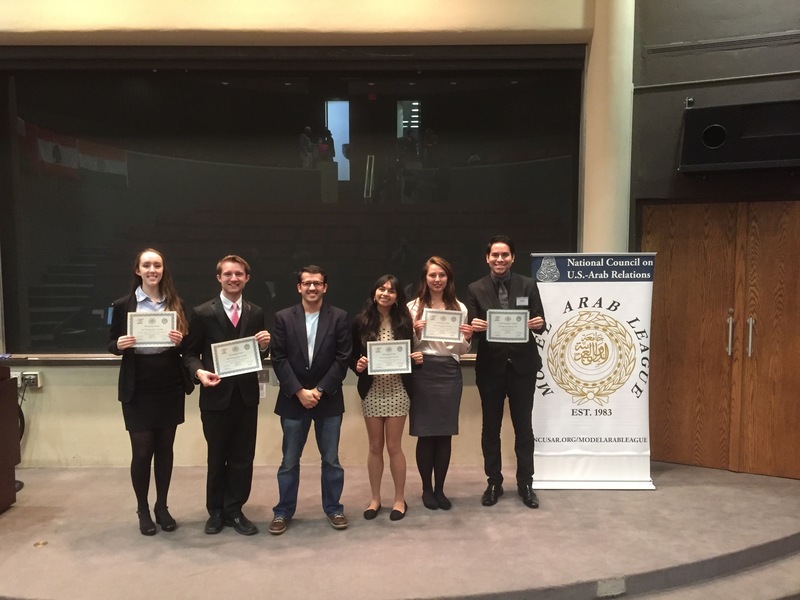 ETSU Model United Nations Club traveled to Roanoke, Virginia, on Nov. 6 to compete in the Model Arab League conference where they were awarded best overall country in addition to several best delegate awards. ETSU Model United Nations Club members who participated in the Model Arab League conference were Megan Butler, Eva Alom, Nathaniel Farnor, Napolean Rivera, Ellen Hagelberg and Melissa McElroy.The students were assigned the country of Oman, and began intensive research early this semester on the history of the country, its political system, society, economy and issues presenting challenges to its security and development. ETSU is the only university in Tennessee to have participated in a national conference of this sort. ETSU competed against 15 other universities at the Model Arab League Conference where the participants were judged based on the quality of the research they had done and how well any resolutions were written and presented along with their ability to delegate with other countries. Not only were the ETSU Model UN Club members who participated in this conference able to walk away with an award for the overall best team to represent Oman in addition to four best delegate awards, they were also able to take away valuable leadership skills and connections with students from all over the globe. Connecting with various universities and having the opportunity to exchange ideas allows to continually work to improve events and strengthen resources. “It’s so much more than just sitting at a conference and doing parliamentary procedure and writing resolutions; you’re getting to engage with other students and universities to see their education practices and get new perspectives and ideas for improvements we can take back to our own university,” Rivera said.